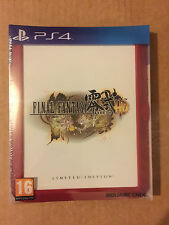 Final Fantasy Type-0 HD - FR4ME Limited Edition Sony PlayStation 4 PS4 Type 0 HD. Condition is Like New. Dispatched with Royal Mail 1st Class Large Letter. 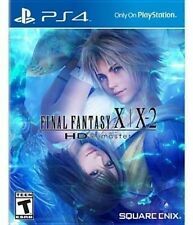 Final fantasy 15 Day One Edition (PS4) *Used* w/ Official Guide and map poster. Condition is Very Good. 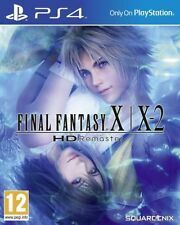 Final Fantasy XV PS4. Condition is Like New. Dispatched with Royal Mail 1st Class Large Letter. Final Fantasy 12 The Zodiac Age PS4. Condition is Like New. Dispatched with Royal Mail 1st Class Large Letter. 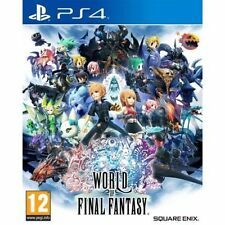 Brand New Factory Sealed - World of Final Fantasy - Day One - PS4 - UK Version. 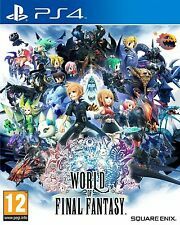 WORLD OF FINAL FANTASY. Playstation 4. WORLD ZONE 1 >>>>> £9.85. And now Books. WORLD ZONE 2 >>>>> £10.20. ALL KINDS OF EVERYTHING. If you are happy with our service. All Kinds of Everything. Explore vast, new lands, including Ala Mhigo, and challenge new Primal threats across Eorzea as you embark on hundreds of new quests as the Warrior of Light! Level cap increased from 60 -> 70. New zones and new dungeons and raids. ps4 game collectors edition a realm reborn final fantasy xiv . Condition is Very Good. Dispatched with Royal Mail 1st Class (1 to 2 working days). 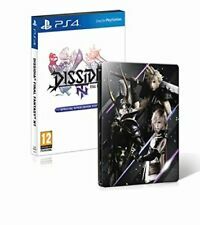 Dissidia Final Fantasy playstation 4 disc and jewel case in nearly new condition. Version: United Kingdom. Item Location: Yorkshire, United Kingdom. Playstation 4. It will Not work on USA or NTSC Consoles. This will work on all EU PAL Consoles. Item Compatibility. Format: PAL (Unless otherwise stated). Limited Edition Steel-case & Official Collector's Edition Strategy Guide with bonus lithograph included. 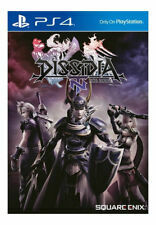 Dissidia Final Fantasy NT Special Steelbook Edition. Item is brand new and sealed and in perfect condition. In very good condition as seen in the pictures. Embark on an adventure unlike any before to an all newWorld Of Final Fantasy. With charming, stylized visuals for both the young and the young at heart, players will collect, raise, and battle iconic monsters by stacking them to form adorable yet strategic monster towers. final fantasy type 0 ps4 Promo Copy. The disc is in excellent condition. Final Fantasy Type-0 HD – Promo. What’s a Promo?. Final fantasy 15 day one edition in box. Used barely, don't know if bonus content will be available.